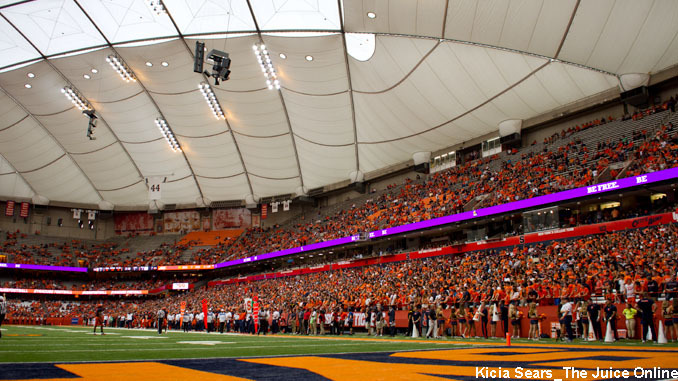 Syracuse football from the Carrier Dome. Mandatory Photo Credit: Kicia Sears, The Juice Online. Syracuse picked up commitments from 2020 Maryland running backs Sean Tucker (announcement) and Marlowe Wax (announcement) over the weekend. Tucker is not rated by 247 Sports, but held offers from Air Force, Kent State, Rutgers and Wisconsin. Meanwhile, Max has a 247 rating of three-stars and an overall rank of 1,394. Pitt, Temple and East Carolina were among the schools that had offered. The Orange also is in the lead for two more 2020 prospects according to 247 Sports recruiting expert Brian Dohn. He recently picked Syracuse in the Crystal Ball for athlete Justin Barron and pro-style quarterback Tyler Van Dyke. Barron, who plays defensive back and wide receiver, is a three-star prospect from Suffield (Conn.) and holds offers from Boston College, Connecticut and Pitt, among others. Meanwhile, Van Dyke is also a three-star prospect from Suffield Academy (Conn.) who has an offer list that includes California, Georgia Tech, Miami and Wisconsin. Syracuse is also in the top 13 for 2020 wide receiver Bryce Gowdy from Deerfield Beach (Fla.), he announced on Twitter. Some of the finalists include Syracuse, Notre Dame, Auburn, Florida State, Florida and Arkansas. The 6-2, 180 pound receiver holds a three-star ranking from 247 Sports and is ranked the 304th prospect in his class. In one basketball note, Syracuse.com’s Donna Ditota reported that Syracuse coach Jim Boeheim and assistant Gerry McNamara visited 2021 prospect Terrence Clarke last week in New Hampshire. Clarke is a five-star prospect rated No. 2 overall in his class by 247 Sports. He currently attends Brewster Academy, the same school attended by former Syracuse players Chris McCullough and CJ Fair. His offer list includes Georgetown, Georgia Tech, Indiana, Kentucky, Michigan and Kansas. That’s all for today from the Syracuse recruiting world. Have a great start to your week!